This article also appears on MSNBC's Hardball HARDBLOG. Senators John Kerry and Russ Feingold sponsored an amendment to the defense authorization bill that would have required the “redeployment” – read pullout - of U.S. combat troops from Iraq by July 2007, in other words, a date certain for the removal of American forces. It also called for an “over-the-horizon military presence to prosecute the war on terror and protect regional security interests.” The amendment was defeated 86-13. Senators Carl Levin and Jack Reed offered an alternative amendment that would have urged President Bush to begin a phased troop withdrawal from Iraq with in a year. That amendment failed by a vote of 60-39. What messages would these amendments have sent to the various groups that comprise the insurgency in Iraq? Of the two proposals, the Kerry-Feingold amendment would have sent a much clearer message to the insurgents – a message devastating for U.S. policy in Iraq and the region. The tactical message would have been that their methods are working. Indiscriminate killing of Iraqis, escalating sectarian violence, continued use of suicide bombers and roadside bombs, the recent seizure and brutal murder of two American soldiers, etc. all have weakened American resolve to the point where the Congress was not only calling for withdrawal, but actually set a date when it must be completed. The timing of this debate in the wake of the brutal murder of two US troops is unfortunate and only reinforces the perception that these tactics are having an effect. The strategic message would have been that if the insurgents are able to survive another year, Iraq is theirs. If this amendment had passed, there would likely be an immediate drop in the level of violence – false encouragement for the Americans to stick to the timetable. The insurgents would merely wait, plan and consolidate their power for July 2007 to re-engage the fledgling Iraqi government and its untested security forces. A date-certain timetable for withdrawal of forces is in essence doing one thing you do not do in fighting an insurgency – cede territory to the insurgents. This proposal would have done exactly that – after July 2007, Iraq is yours. Maintaining an "over-the-horizon presence" says to the insurgents that we’re going where they aren’t – again ceding territory. What happens when the insurgents show up there as well? Will we “redeploy” somewhere else? Additionally, this amendment would have had the unintended consequence of forcing the military command in Iraq to expend its resources preparing to withdraw troops and materiel rather than focusing on combating the insurgency and completing the training of Iraqi security forces. There should be debate over the prosecution of the war, but setting a timetable would have sent the wrong message. It could have been a recipe for failure. Just before sunset on June 16, three soldiers manning a checkpoint in the volatile Yusufiyah area about 18 miles southwest of Baghdad came under attack. One soldier was killed and two are missing. This raises a host of questions - unfortunately there are few answers yet. First, how did this happen? Normally when setting up checkpoints, they are placed in positions that can see at least one other position, either a checkpoint or a firing position. The theory is that the positions can provide what is termed mutual support - covering and supporting fire and a quick reaction. From the official reports, it was 15 minutes before an American reaction team arrived on the scene. ** New information: The three soldiers from the 101st Airborne Division were part of the three-vehicle element operating a checkpoint in the Yusufiyah area. Two of the HMMWV's gave chase to a suspicious vehicle, leaving the third vehicle alone. It appears that this was a planned ambush - the suspect vehicle drew off two of the three vehicles, leaving the third vulnerable. Insurgents then attacked and overpowered the three soldiers, killing one. There are reports from locals that the two were seen being taken away by car. Second, who most likely attacked the checkpoint? The Yusufiyah area has been a hotbed of "Al-Qa'idah in the Land of the Two Rivers" (Al-Qa'idah in Iraq) activity over the last three years. It would not be surprising that this group, formerly headed by the recently killed Abu Mus'ab Az-Zarqawi, would mount this type of attack. What better way to prove that the group retains operational capability than to capture two American soldiers? Third, what now? I think it is unlikely that they will be found. As I once learned in training, if you can avoid capture for 20 minutes, you have an excellent chance of escape. Every minute beyond that, the size of the search area expands exponentially to the point that it is extremely difficult to be effective. It has been well over 24 hours since the incident. I fully expect that within the next few days we will see a videotape on Al-Jazeera or another Arabic language network showing the two soldiers in the hands of an insurgent group. If this happens, the tape will no doubt have a significant psychological impact on the American public. Unfortunately, there are now two American soldiers probably being held hostage by an Al-Qa'idah group - the result of an incident that should not have happened. My comments on MSNBC (video). A document (read the text) found in the house in which Al-Qa'idah in Mesopotamia leader Abu Mus'ab Az-Zarqawi was killed reveals the status of the organization and proposals to counter recent reverses. My review of the document leads me to the conclusion that this is an analysis prepared by some in the Az-Zarqawi organization, more likely for Az-Zarqawi rather than by Az-Zarqawi. According to the document, the Iraqis and coalition forces have succeeded in damaging the organization. Notably, the author cites the establishment of Iraqi security forces as limiting the amount of casualties that the group has been able to inflict on American forces. Because the group cannot inflict an increasing number of casualties on the Americans, time is no longer on the side of the insurgency. Previously, Az-Zarqawi was of the opinion that if he continued to cause American casualties, adverse public opinion in the United States would lead to demands for the troops to be withdrawn. The author believes this is no longer the case. The advantage of time has shifted to the coalition and Iraqi government. The author provides several reasons for this conclusion. Of significance are the increased operations by Iraqi security forces and effective coalition operations in "resistance areas." I think this refers to the series of American-led operations over the last six months in the Euphrates River valley aimed at destroying the supply line between Baghdad and the Syrian border, as well as increased troop presence in the volatile cities of the Sunni triangle - Ar-Ramadi, Ba'qubah, Fallujah, etc. The author goes on to list a few things that should be done. Of interest, he cites "mistakes that blemish the image of the resistance." I take this to mean the videotaped beheadings and the continued attacks on Shi'a shrines. These activities are in direct contravention of the instructions sent in a letter from Al-Qa'idah's number two leader Ayman Az-Zawahri to Az-Zarqawi in July 2005. The author's solution to the "current bleak situation" is to foment a conflict between the United States and either the Iran or the Shi'a Muslims in general, citing the positive impact on the Az-Zarqawi group that resulted from the battle between the Al-Mahdi Army of Shi'a leader Muqtada As-Sadr and American forces. The author lists a series of options to cause this type of conflict, including battles between the various Shi'a factions, the Shi'a and the Kurds, the Shi'a and the Americans, etc. In the end, the author comes to the conclusion that the best course of action, the one that will help the insurgency the most, is to foment a war between Iran and the United States. The author believes this will be difficult, assessing that Iran is actively assisting the United States in both Afghanistan and Iraq. The key, according to the paper, is to play up the danger to America and the west from Iran. The paper presents an interesting look at the insurgency and its analysis of the situation in Iraq. Abu Mus'ab Az-Zarqawi,the leader of the Al-Qa'idah in Iraq organization, was killed in an American air strike on June 7, 2006. It is likely that Az-Zarqawi would be alive today had he not made what I regard as a fatal misjudgment. On November 9, 2005, followers of Az-Zarqawi conducted suicide bomb attacks in three tourist hotels in Amman - the Radisson SAS, the Grand Hyatt, and the Days Inn (two at which I have stayed) - in which 60 people were killed. A woman with a bomb strapped to her body was detained before she could detonate the device in the Radisson. Her husband was successful in detonating his own device, killing 38 people attending a wedding, including the bride and groom, and American filmmaker Mustafa Al-'Aqad. 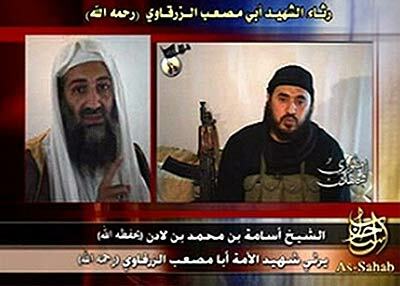 * Interrogation of the woman revealed that the mastermind behind these attacks was Abu Mus'ab Az-Zarqawi. A believable rationale for these attacks has never been articulated. Up until this incident, Az-Zarqawi enjoyed almost cult status in Jordan, sort of a Salah Ad-Din figure battling the forces of the west, "crusaders" of a sort. However, this operation which killed almost exclusively Arabs and Muslims, turned public opinion against the Jordanian-born Az-Zarqawi. Az-Zarqawi had already been sentenced to death in absentia twice in Jordan, once for an attempted attack in 1999 on the same Radisson SAS hotel in Amman, and again for complicity in the 2002 murder of US Embassy officer Lawrence Foley in the 'Abdun section of Amman. Despite these sentences, the Jordanian authorities never really pursued him as long as he remained outside the country. In response to this senseless operation, King 'Abdullah II met with Muhammud Zahabi, director of the Jordanian General Intelligence Department (da'irat al-mukhabarat al-'amah), the GID. The king told Zahabi to find Az-Zarqawi and eliminate him. This order was Az-Zarqawi's downfall. The Jordanian GID is easily the most professional of all the numerous Arab intelligence organizations. They are professional, well-trained, disciplined and effective. The key to the successful elimination of Az-Zarqawi would be predicated on timely, accurate intelligence delivered to an operational element with the capability to put weapons on the target. That's exactly what happened. The Jordanians provided much of that timely accurate intelligence based on their much greater understanding of the region and long-time intelligence sources in Iraq. It is important to note that the air strike was conducted in concert with a series of as many as 17 other raids of suspected Al-Qa'idah safe houses. Hopefully, the intelligence gained will allow the Iraqis and coalition to eliminate the remainder of Az-Zarqawi's group. At the very least, the organization will be is temporary disarray as they try to determine how their operational security was compromised. * On a personal note, Mustafa Al-'Aqad was the brother of one of my Arabic language instructors at the Defense Language Institute, and friend Usamah "Sami" Al-'Aqad. My condolences are with Sami's family. This article appears on the MSNBC Hardball Blog. Incidents in two Iraqi cities have focused world attention on possible misconduct by US forces in Iraq. Although US forces were cleared of misconduct allegations stemming from a March 15 incident in Ishaqi where at least 13 people were killed, a criminal probe has been launched into the November 19, 2005 incident in Haditha where US Marines are accused of killing a group of unarmed Iraqi civilians. First, if there was misconduct, if the Marines did kill innocent civilians in a rage after losing one of their own, they should be – and will be – held accountable. If there was an attempt anywhere in the chain of command to cover up what happened, those responsible should also be held accountable. Those of us who served in the post-My Lai Vietnam conflict know full well how important this is. The investigation will eventually determine what happened last fall. Guilt or innocence will be determined, punishment, if warranted, will be meted out, and policies may be changed. That’s the black and white. Now let’s look at the grey. Haditha (and Ishaqi) is located in the Sunni area north of Baghdad, the so-called “Sunni triangle.” It has been a hotbed of insurgent activity since the war began in 2003. US forces there have been subjected to unending attacks, mostly with improvised explosive devices (IED’s), homemade bombs placed alongside the roads the troops must travel to patrol the area. The November 19 attack involved such a device – a 155mm artillery shell wired to a detonator. IED’s have been the insurgents’ only effective means of attacking US forces – directly confronting the better trained and equipped Americans has proven futile. Making and planting IED’s cannot be done in a vacuum. Someone - or more likely many – in Haditha were aware of insurgent activities. Although the residents may not be direct participants in the insurgency themselves, they have not provided information to either the US or Iraqi forces. To the soldiers and Marines on the ground, this amounts to tacit cooperation with the insurgents. The biggest complaint among the American troops is not knowing who the enemy is and whom to engage. When troops come under these anonymous IED attacks, they are naturally disposed to strike back. The question is, against whom? It is extremely frustrating for these young soldiers and Marines to get hit with these IED’s, suffer casualties and not be able to respond. We don’t yet know exactly what happened at Haditha. I am surprised we don’t have more of these incidents. I have maintained for a long time that the residents of these towns, particularly in that area north of Baghdad, know exactly who the bad guys are, and when and where they set up these devices. I am not excusing the alleged actions of the American troops in this case, but I can understand the frustration that causes them. The potential for more of these incidents, and the insurgency itself, will continue until the Sunnis decide they are going to be part of the solution and not part of the problem.